Some time back, we decided to get an aquarium for the family room. Some folks told me looking at fish swimming can be very relaxing. And God knows we can use some cheap relaxation. So we settled on a small tank, about 8 gallons, I think. We filled it with some tiny fishes. And then added a few more. And then some more. And well, you can probably tell where this is going. Pretty soon, we needed a bigger tank. Another friend suggested looking at a 29 gallon aquarium. Apparently, that’s not so big and not so little and should fit our needs well enough. So we shopped around and ended up buying the Oceanic 82052 BioCube Aquarium, 29-Gallon. Here’s what we think about it. Curved glass front corners for panoramic view. Cora life compact fluorescent lighting with dual fans. BioCube Aquarium systems built-in necessary components. Integrated wet or dry biofiltration contained in back wall. The Oceanic brand is one of the more common ones to pop up when you do a search engine query for a 29 gallon aquarium. The company manufactures aquariums and its accessories like pumps and filters. I started reading up on the Oceanic BioCube line and found out that they can be used for both freshwater and saltwater setups. The BioCube line also features enhanced filtration systems, replaceable 2-stage filter cartridges for easy to maintain filtration, a wet/dry filtration system and a viewing window for the filtration pump so optimum performance is always achieved. Having a small 8-gallon aquarium hardly makes me an expert so I was a little weary of the whole shopping process. 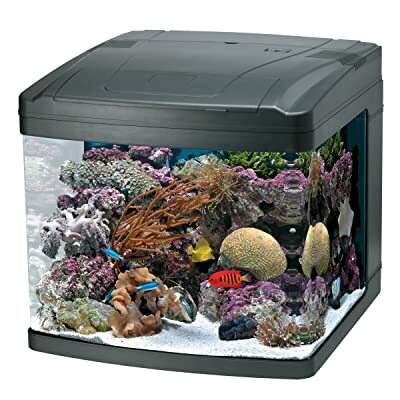 Reading some reviews about this 29 gallon aquarium from Oceanic didn’t really do much to allay my fears. Some of the reviews aren’t stellar in the least, you know? But we put our apprehensions aside and finally just ordered one off Amazon. And I have to say, it was a good decision! First, the aquarium came in just perfect! There are no broken parts and set-up was easy enough. I did have a bit of trouble with following the instructions. I’m not sure if I’m not reading them right but it kinda looked like the pictures and the actual thing were actually opposite. Other than that, though, it was all very easy. I read that Oceanic aquariums had trouble with faulty lights and leaks but the company must’ve fixed those issues because we didn’t experience any of that at all. The aquarium looks good and has everything we needed already built in. I loved how the wet/dry filter system only makes a sound like water trickling. It’s all very soothing. The lighting system is quite high tech and can be set to mimic the natural light at different times (dawn, dusk, daylight, night time- the Lunar Blue-Moon-Glow LEDs are awesome). I particularly think that’s a nice touch. The only problem we had with this 29 gallon aquarium is with the cooling fans. They’re not really irritatingly noisy, but the sound is noticeable, especially when starting up at “daylight.” The top also doesn’t hinge like in our smaller tank before. It has a tendency to trap the heat and we’re actually looking at a supplementary fan to fix the issue. Separate cords for lights to emulate natural lighting is a plus.